With over 3,857,799 people in Los Angeles it easy to see why it is the second largest city in the United States. Los Angeles’s elderly population that are 65 and older is close to 405,068. This means roughly 10.5% of people in Los Angeles will at some point need help. For many that help will come in the form of Los Angeles Home Care Services. In such a large city many challenges can arise while servicing the growing elderly population. One of these challenges is when patients and caregivers fall ill. The main culprit in the fight to stay healthy is the flu. Los Angeles has seen an unprecedented increase in the flu 2013- 2014 flu season. On January 10th the LA Times reported “In Los Angeles County, Department of Public Health epidemiologists on Friday reported 575 confirmed flu cases so far this season, 222 of which were documented in the week from Dec. 29 through Jan. 4. Six people are believed to have died from influenza in the county. The Department of Public Health reported that all were adults, but did not provide victims’ ages. In some Los Angeles-area hospitals, doctors said they had noticed a spike in patients showing up with flu symptoms such as sneezing, coughing, extreme fatigue and fever”. The California Department of Public Health in Sacramento also mentioned the flu season started sooner and more severe than had anticipated. 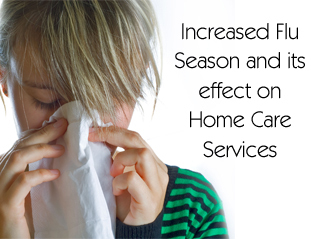 It is a known fact that the elderly are more susceptible to flu and its symptoms. It is easy to see why an increased flu season and an increasingly fragile elderly population can be a challenge to the home care services landscape. Although with all challenges we must rise to the occasion by minimizing the risk of spreading the flu. Below you will find great ways for any Los Angeles Home Care Agency to help fend off this nasty bug. Many professionals say that the flu vaccine is the best way to fend of the flu. The vaccine works by causing antibodies to develop in the body roughly two weeks after taking the vaccine. The vaccine is developed to defend against which flu strains experts think will be most prevalent during the flu season. The CDC also recommends that the two groups who especially should get the vaccine are people who are at high risk of complication, like pneumonia, and individuals who are taking care of people who are at high risk of complications. These two segments make up the majority of the patients and caregivers in the Los Angeles Home Care Services. This is why many Home Care Agencies will provide or offer flu vaccines to their patients. One of the best ways to help stop the spread of the flu is to wash your hands. Keeping your hands clean will gravely decrease the risk of transferring germs. You may also choose to also carry around a personal bottle of hand sanitizer. Germs can live on surfaces for two hours or more. This means knobs, elevator buttons, phones, and communal interactions can be susceptible ways to contract germs. Web MD posted, “The flu vaccine is the best way to prevent flu, but the next best thing is good hand hygiene,” says Rachel Orscheln, MD, an infectious disease specialist and pediatrician at Washington University School of Medicine in St. Louis. “Cover your mouth and nose with a tissue. Then wash your hands every time you cough or sneeze to prevent spreading the virus.” The post also mentions that proper hand cleaning involves more than a simply washing with water. Be sure to always use soap and water as well as lather for at least 15 to 20 seconds. One good way to be sure you have done enough time is to sign the happy birthday song twice. Another remedy that can help with keeping your body healthy is sleep. That’s right catching the right amount of sleep can affect your immune system. Many studies have shown that lack of sleep can increase your risk of getting sick when exposed to a virus, such as the flu. While you’re sleeping your immune system releases cytokines. There are certain cytokines that need to increase when you have an infection or inflammation. When you are sleep deprived it may decrease the production of these cytokines, as well as infection-fighting antibodies.